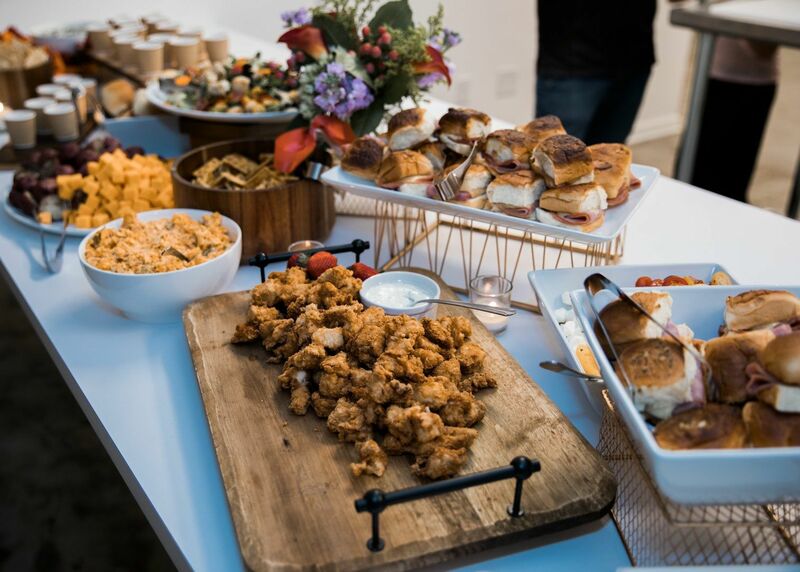 From corporate lunches to magnificent weddings, you can have confidence in Heritage Catering – knowing it’s made from quality, housemade ingredients. It’s food that tastes great, and you can feel good about eating. 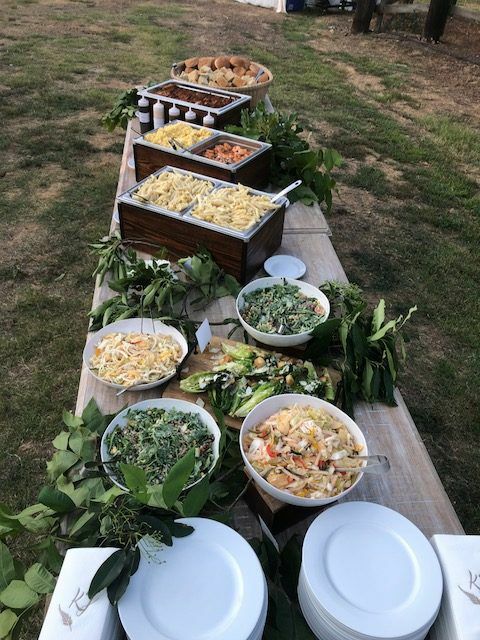 Heritage Catering is a full-service catering company offering food, beverages, serving equipment, and staff for your next event. So much of life happens at the table, where family, friends, and co-workers come together to share experiences and build lasting memories. 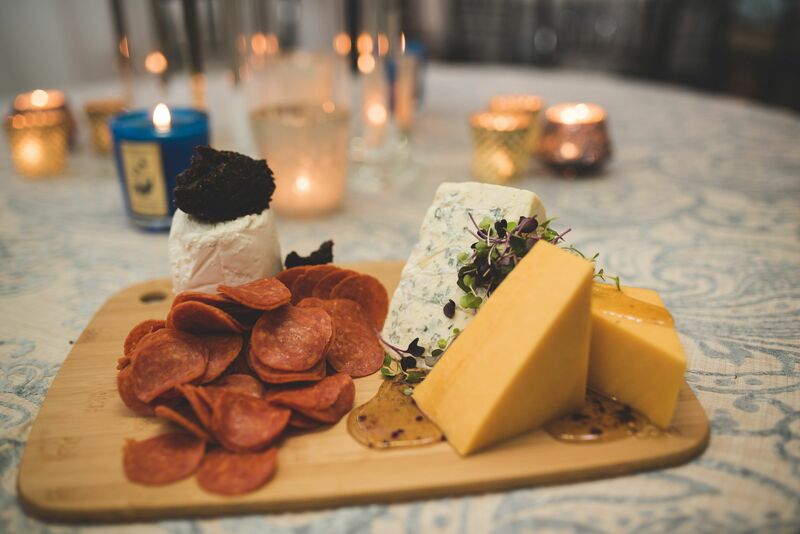 Heritage Catering hopes to help you fill that table with great food, prepared with love. A new company built on years of experience, Shane and Kim Henderson each bring over 20 years in the hospitality industry. Our past experiences, family traditions and shared memories are what heritage is all about. We want to help you make everything from ordering lunch to planning a wedding effortless, fun, and easy. You can have confidence in our food knowing that all our ingredients are top quality and housemade. 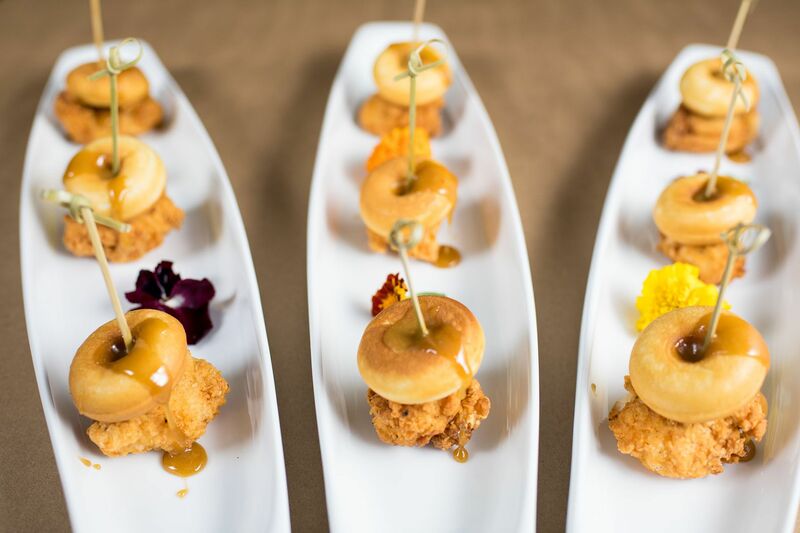 We’d be honored to serve the bite of food that transports you back to your wedding. Or the lunch that gets you through the work day. 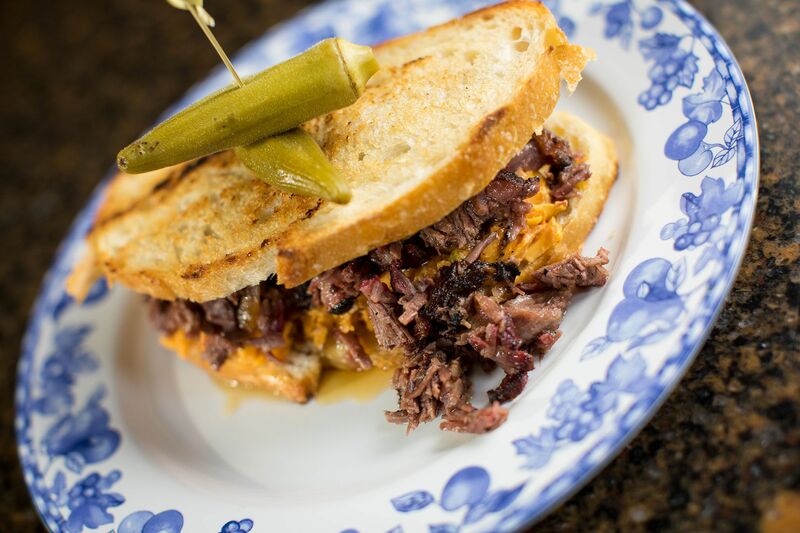 We can’t wait to share our love of food and passion for good Southern hospitality with you. Kim’s love of food and entertaining started at a youthful age from family meals to special celebrations. 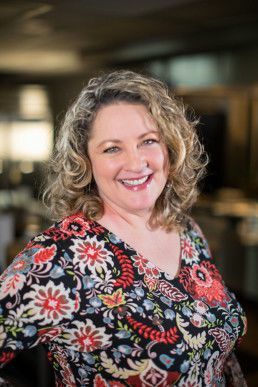 Eager to learn all aspects of the foodservice industry, Kim has held many various positions to become the well-seasoned professional she is today. Kim’s degree is in Marketing from the U of A in Fayetteville but her true passion is serving others. She’s held positions in the front and back of house. Kim has managed many different facets of the hospitality industry. From working at Aramark at three different universities to Operations Manager at Simply the Best Catering and Purchasing Manager at Ben E. Keith. In 2017, Kim decided to follow a lifelong dream, and open Heritage Catering. 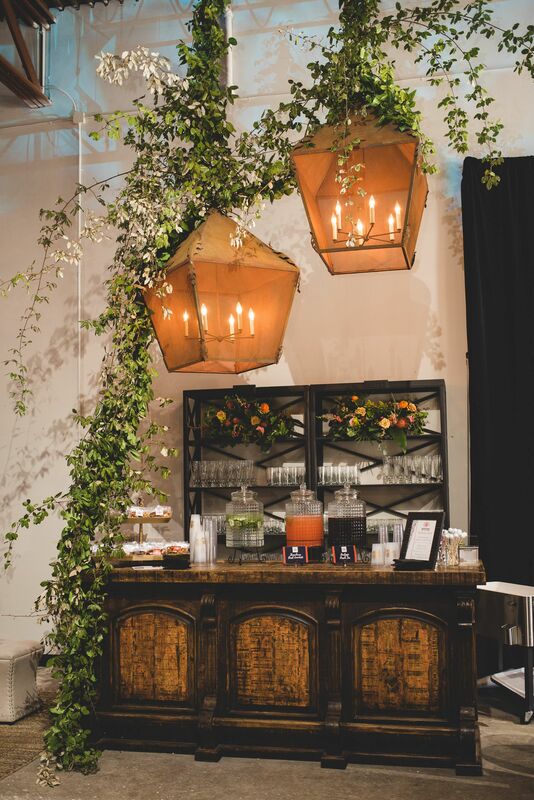 You can rely on Kim’s attention to detail, timeliness, and creativity to make your next event spectacular. 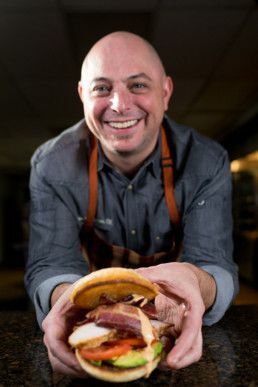 From his small town Southern roots as a preacher’s son raised on church potlucks, Shane has grown into a skilled, professional chef. He attended the prestigious culinary school at Johnson and Wales in Providence, RI. While on the East Coast, Shane learned time-honored methods of preparing fresh seafood and embraced the art of home-style Italian cooking. 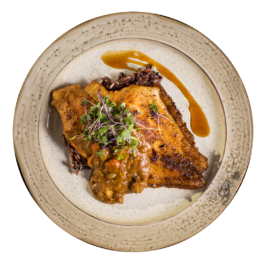 Shane’s Executive Chef experience ranges from a private college, country clubs and catering to founding the Argenta Market. 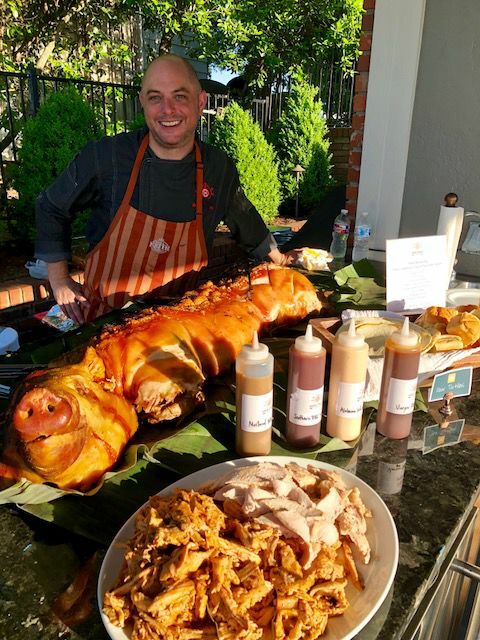 Since 2010, Shane serves as the Executive Chef for Ben E. Keith Foods, Mid-South Division. Shane lends his expertise to independent restaurant operators, nursing homes, hotels and hospitals. He also contributes to many philanthropic events and non-profit organizations including Youth Home and Thea Foundation. Shane taught at Pulaski Technical College’s Culinary Arts & Hospitality Management Institute for four years. He has won the Salut au Restauranteur Award, the “Gold” Award presented by the Central Arkansas ACF for lifetime service to culinary education and was named Pro-Start Mentor of the Year. 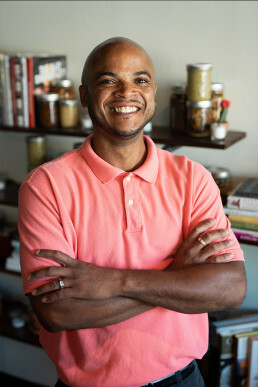 Shane serves as a member of the Arkansas Tech University Advisory board, the American Culinary Federation and Arkansas Hospitality Association. Heritage Catering would like to welcome Chris Mosby as the newest member of the Heritage Team! Chris will serve as Operations Manager. Look for his smiling face at your next event. It’s made with fresh grapefruit juice, mint simple syrup and club soda, then topped with cotton candy! So cute for any event!! Getting married? 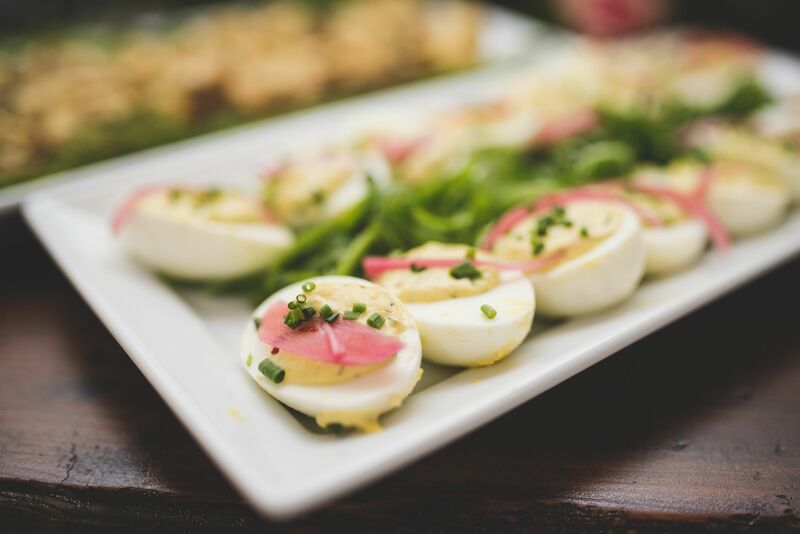 Now is the time to start planning catering for your special day! Heritage is full service caterer offering food, beverages, equipment and staffing for special event. We have menus listed here on our website, but we love to get creative and come up with a menu that is a reflection of the bride & groom! We can provide nonalcoholic beverages along with bar services. Heritage Catering is a licensed & insured company. We carry an off premise caterers liquor license, general liability insurance and liquor liability insurance. You’ll fall in love with our professional & courteous staff. They will be there to attend to your every need! Call 501.246.3787 or email kim@heritagecateringar.com to schedule your consultation!! 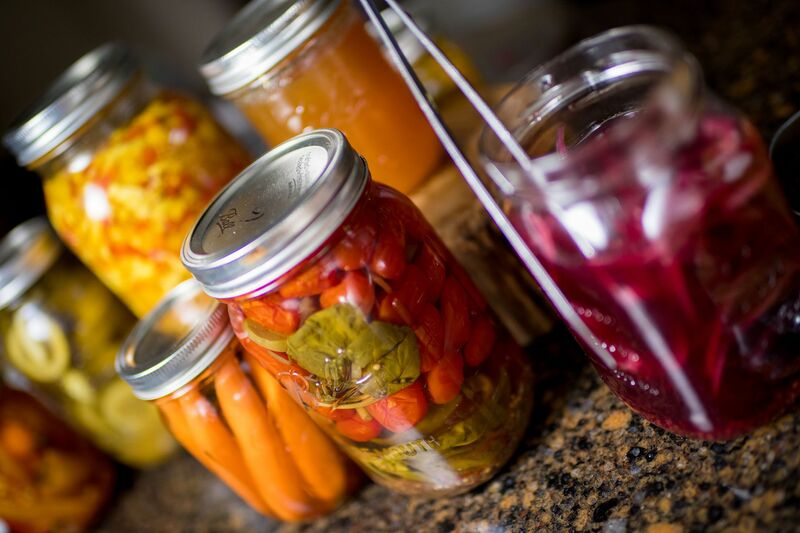 From savory to sweet, all of our items are prepared with love using seasonal ingredients and top-quality products. These menus create a beautiful presentation for any occasion. Pricing is for food items only. Please speak with a sales representative to add extended event services like beverages, staffing and rental coordination for your event. You’re welcome to mix and match menu items, or we can customize a menu exclusively for your special gathering! Fresh brewed Westrock coffee with sweeteners, creamer and stirrers. Serves approx. 10 guests. Pour the bubbly, splash some juice, garnish with fruit. Cheers! Bottled Perrier Sparkling Water — $3 ea. 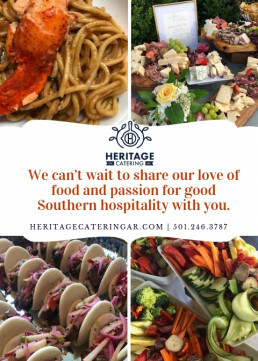 At Heritage Catering, we embrace the idea of blending ingredients, experiences and heritages of our culinary team and customers. Our seasonings are blends we created. Our dressings and sauces are homemade. We smoke & roast our own meats. We can customize any menu upon request! Minimum order of 10 guests, and must be the same menu item. Maximum of 2 entree or bowl selections per order. All orders include sustainable disposable plates, cutlery and napkins. Portions are appropriate for lunch. For dinner servings, please add $2.50 per guest. Organic & local sourcing is available at an additional cost. If you’d like your menu prepared with these ingredients, ask the sales representative for more details! 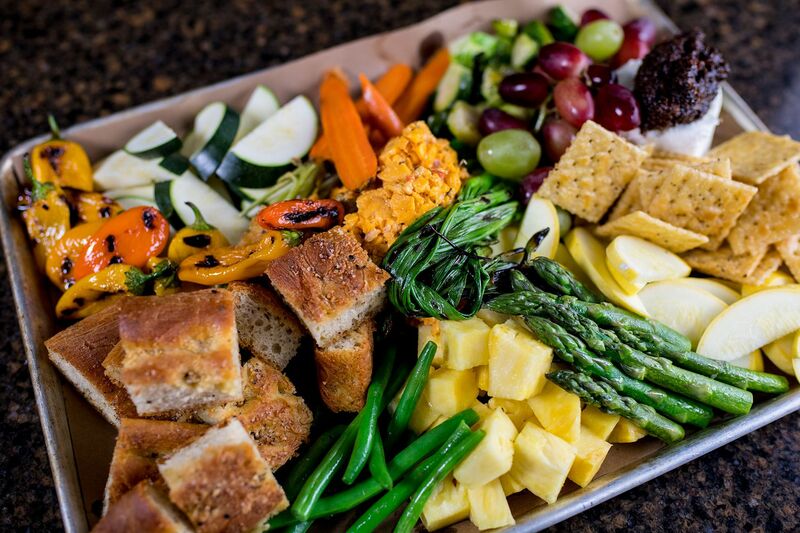 Drop Off Catering is available anywhere in Arkansas! The delivery fee for the Little Rock Metro area is $15. Please inquire for delivery charges outside of Little Rock. Everything is served in disposable containers. Please speak with a sales representative for details about our Full Service Catering! Poached chicken with pickles, onion, celery and fresh dill on croissant *Seal family recipe! Served room temp in individual eco-friendly container. These are easily adapted to accommodate a variety of dietary restrictions. Heritage Kitchen Sink Cookies — $18 *Our best seller! Bottled Water — $1.50 ea. Canned Soft Drinks — $2 ea. Bottled Soft Drinks (with real sugar) — $3 ea. 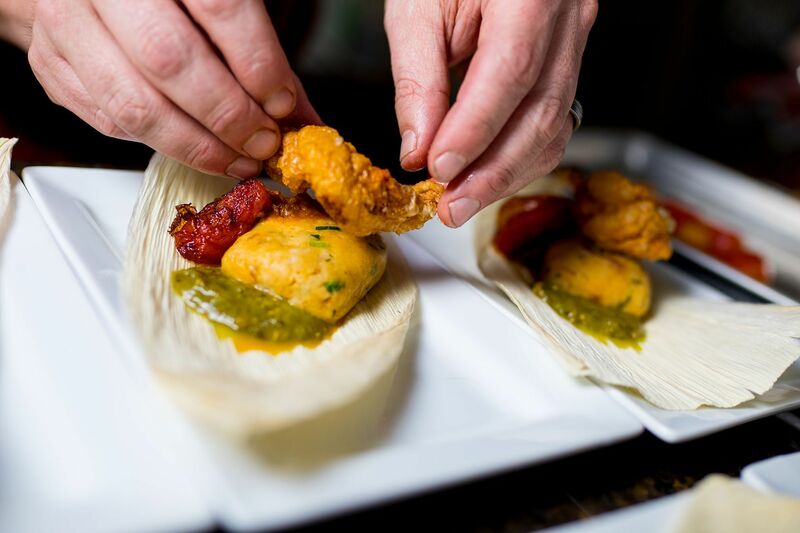 At Heritage, we strive to provide our customers with memorable culinary creations and unique event experiences. We are committed to using the freshest, quality ingredients available. We work with each client to create a personalized menu for their special event. You can order from this menu or customize something special. 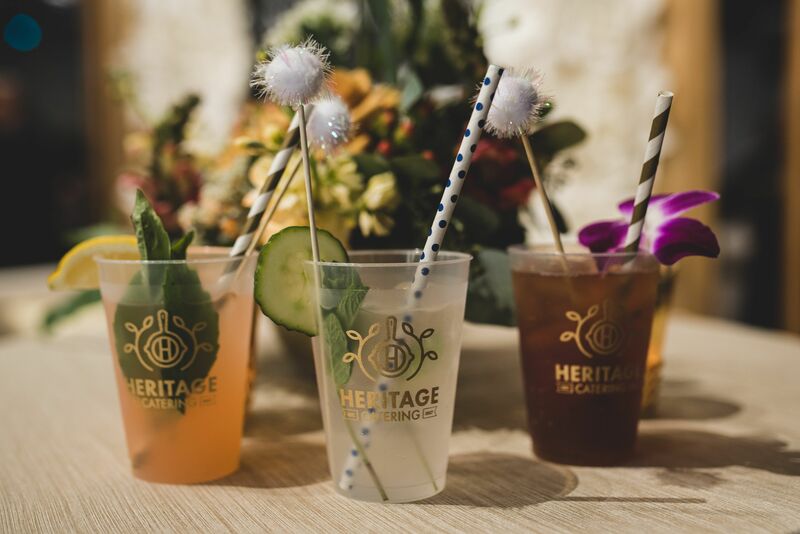 Heritage has extended services including beverages, event service and rental coordination. 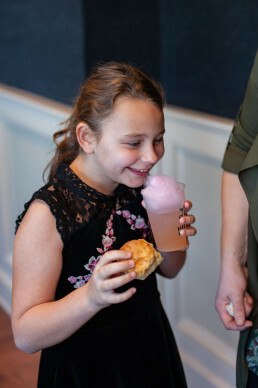 As your catering partner, we embrace our Southern heritage, and together celebrate moments that become great memories! Each Board serves approx. 10 guests & is served on a half sheet pan. 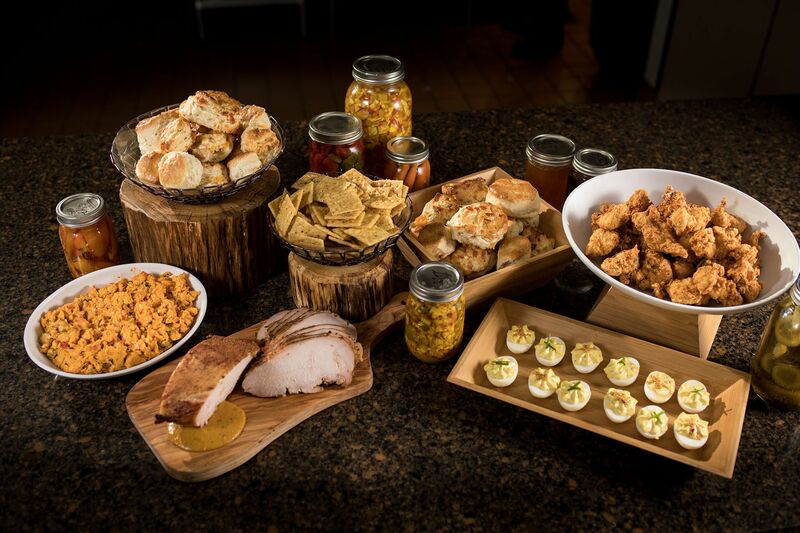 Perfect for a family gathering, ladies night, tailgate, bridal party snacks & TV watch parties! We request 24 hour notice for all orders. Depending on inventory, day of orders may be accommodated. Perfect pre-wedding snacks for the guys and girls! Pair with the Heritage Board for the ultimate spread! This board has the true Foodie in mind. Let’s have some fun with this one! 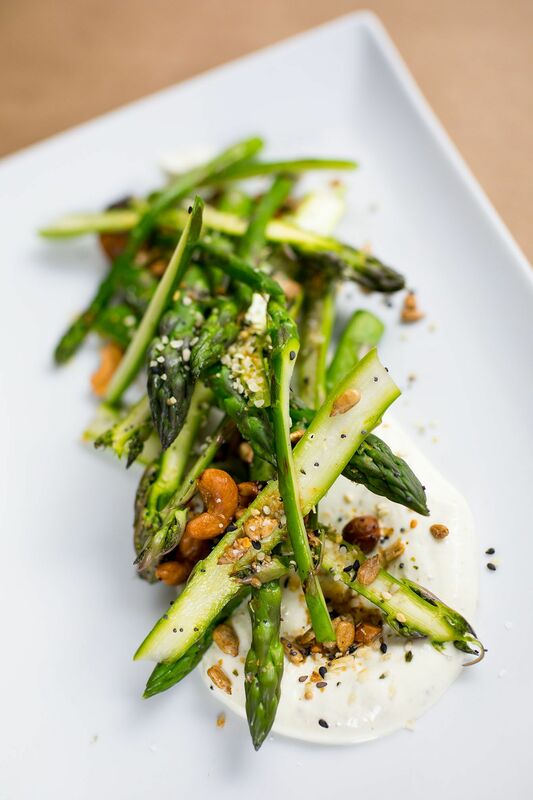 We’ll source local, seasonal veggies from Farmers. We’ll find delicious regional cheeses, and track down tasty meats from the finest butchers! A: For wedding & special events: A $500 deposit is required as soon as possible to confirm the reservation. Deposit is non-refundable and non-transferable for other services or dates. Cancellation forfeits deposit. A guaranteed head count and 50% payment is due 30 days prior to the event. Guest count may be increased after such time but not decreased. Final payment and guest count is due 1 week prior to the event. All payments are non-refundable. There is a $25 late fee and 10% finance charge if these terms are not met. A: We prefer cash, cashier’s checks, debit and credit cards, but will also accept personal checks. Q: When do you need my final guest count? A: For weddings & special events, a guaranteed count is due 30 days prior to the event. Guest count may be increased after this time but not decreased. Final head count is due one week prior to the event so we can prepare accordingly. Q: How do I make my deposit & any subsequent payments? A: You can mail or drop off payments at our office, located at 315 N. Bowman Road, Suite 2, Little Rock, AR 72211. For credit card payments, we can email you a credit card authorization form for you to complete & email back to us. You may also make your credit card payments by phone: (501) 920-5241. Q: Are there additional fees or charges? A: Everything will be line itemized on your proposal and invoice. Applicable taxes will be applied to each event order. If Heritage Catering staff is working your event, there will also be a 15% service charge added to the total of the bill. The service charge is not a tip or gratuity for staff. The service charge is to cover the overhead expenses like insurance, office supplies, van fuel, rent and administrative expenses. Tips (gratuity) to the staff are solely at your discretion. A: Should it become necessary to cancel your event and terminate the contract, the client will be responsible for all expenditures to date, including but not limited to food and labor expenses, special orders, rentals and/or proposals costs. All deposits and payments are non-refundable. If, due to emergency, the client wishes to reschedule the event at a location and date agreeable to Heritage Catering, we will be pleased to honor these arrangements. 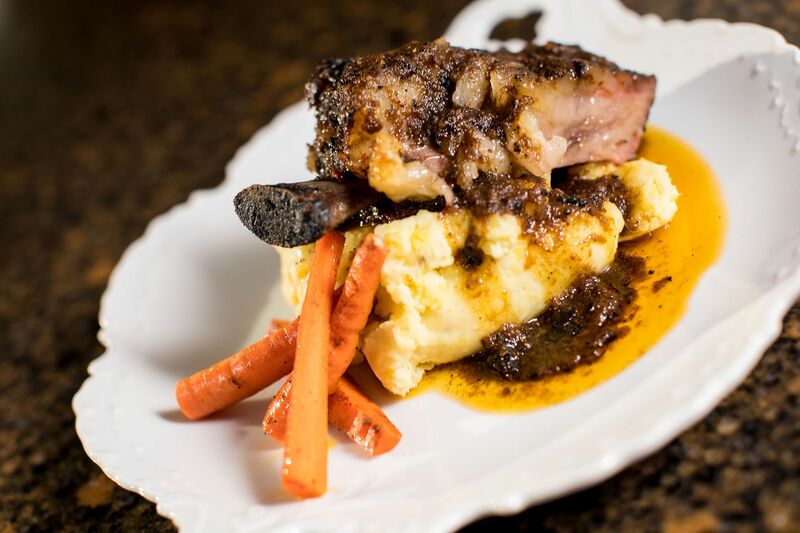 A: Yes, our Chef is happy to prepare a selection of menu items based on the menu created for your event. There will be a sampling of the items you can expect for your guest to enjoy at your event. Tastings are limited to parties of 4. We charge a $100 flat rate for each tasting. A: If you know your event date, we always recommend you reserve your date as soon as possible. Once you have signed your contract and paid the initial deposit, your date is locked in and on our calendar. Weekends during “wedding season” can fill up quickly. Corporate lead times are much shorter. Most times, we can accommodate smaller corporate requests, such as lunches, in a matter of days. Q: Can you accommodate for dietary restrictions on my menu? A: Yes, we have a wide variety of vegetarian, gluten-free, allergy-sensitive and other special needs menu items. When planning your event, we will discuss your dietary needs and will suggest a menu that will be suitable for you and your guests. Q: Can you provide service staff for my event? A: Yes. 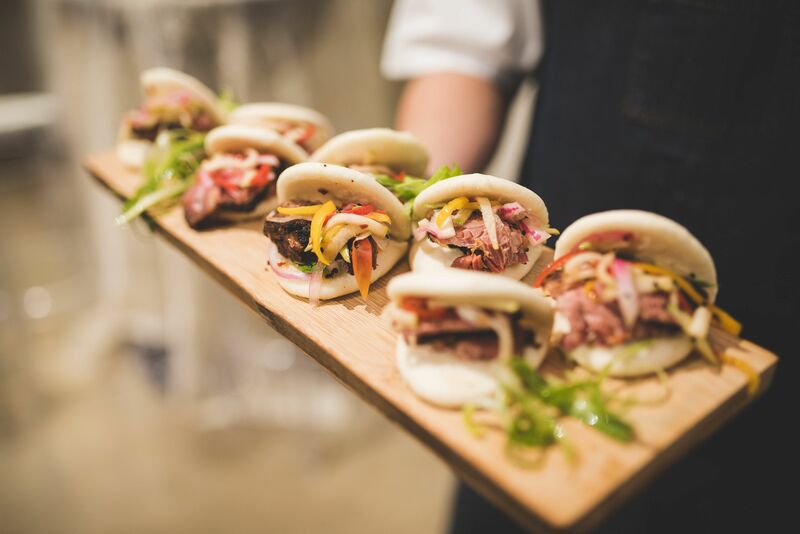 Heritage Catering can provide servers for your event for $25 per hour, per server. This charge is calculated from the time they leave Heritage Catering until they return. Heritage servers will provide agreed upon setup and breakdown of the event, maintain food and beverage areas to ensure cleanliness and will bus tables. Our staff is also responsible for cleaning their work area and following the rules of the venue. Q: What does your staff wear while working events? A: Our servers and bartenders wear black pants, black, long sleeve, button-down collared shirts, black shoes and a Heritage Catering apron. Q; Do you charge a cake cutting fee? A: No, if Heritage servers are working your event, they will be happy to cut the wedding cake. Q: I’m planning on providing alcohol at my event. Can I hire your bartenders to serve it? A: Yes, if you plan to provide alcohol for your event, Heritage can provide bartenders. The charge for bartenders is $30 per hour, per bartender. The client is responsible for delivering alcohol to the venue. Q: Is Heritage Catering licensed and insured? A: Yes, we have all licenses, permits and insurances that are required to prepare and serve food and beverages. We can provide you and/or your event space or company with a copy of these if needed. Q: Can you provide rental items for my event? A: Absolutely! We can arrange for the usual party items such as tables, chairs, linens, china, glassware and silverware. We can also arrange for larger items such as tents, stages and dance floors. Q: Can I customize the menu and services for my event? A: Definitely! We are here to serve you, and want to create a menu that suits you best. You can add beverages, equipment and staff. 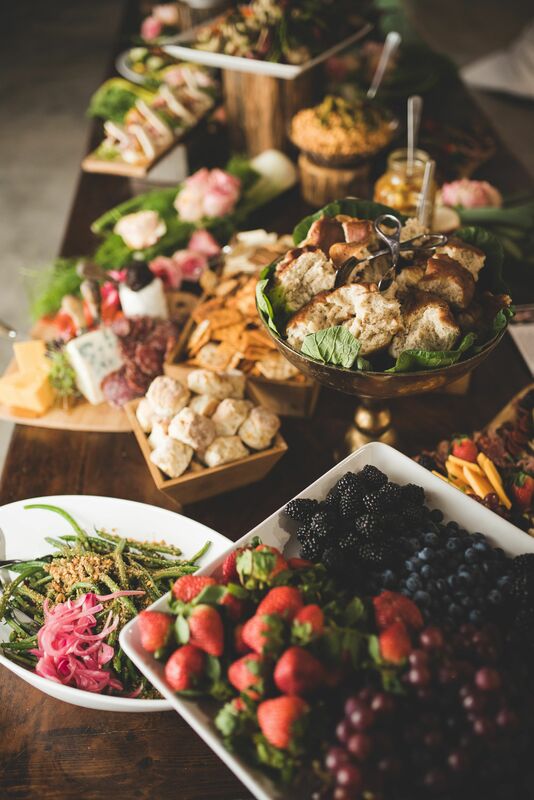 The factors that affect the price of an event include the number and kind of menu choices, number of guests, length of the event as well as number of servers required. Our goal is to give you the fairest price based on your specific needs. © 2017 Heritage Catering. All Rights Reserved. Website design and development by Cranford Co.